Wrong forum. Is Maidstoned taking this job seriously? Most years there are a lot of US tourists about. This year we are in Puerto Vallarta and there are almost none. We did find one American couple and we asked them why. They said that everyone is afraid of Mexicans these days. Did you ask why they are afraid? Is it for legitimate reasons or due to scare stories generated in the US? i says it's in the right forum as It feels more like a soap opera than politics with Trump in power. Was the same at the world cup. Last edited by Adlerhorst; 12-01-2019 at 08:42 AM. Obviously everyone is a bit of a stretch. 31 countries recognised propaganda when they saw it and went and had a party. Why isn’t this in the politics forum? Probably because Trump treats his presidency as a reality show as distinct from the serious office that it is. Why isn't it in the World of Sports forum? He has a golf course in Scotchland. 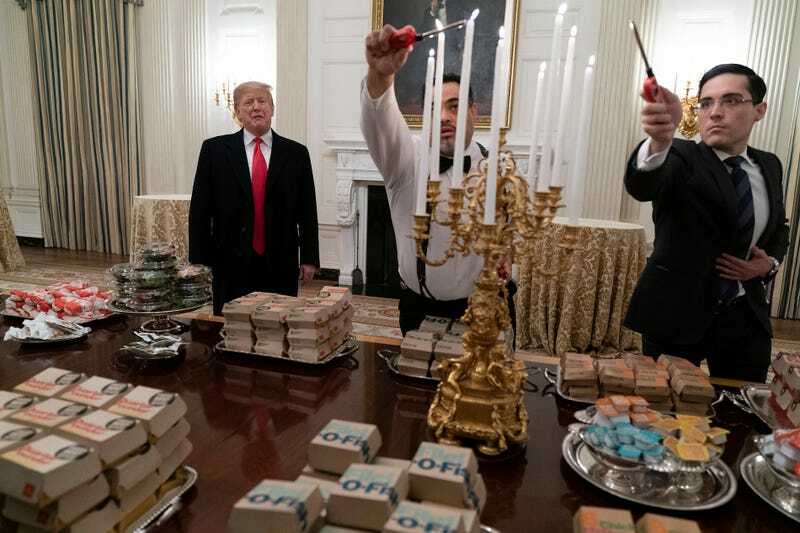 I thought that link would lead me to the dinner he provided when Clemson came to the White House to celebrate their National Championship in college football. Won't that food get cold? No the blokes with the torches will warm it up. Using the word “food” very loosely. Trash might be more appropriate. In the land of the blind, the one-eyed man is the king. Go back to sleep, you yellowed-bellied freaks. He’s a patriot and buying American. Thought that was all he eats anyway.